I can’t wait to get into the pool today. Two days ago I had what felt like a breakthrough swim. Those days are so exciting and I hardly wanted to get out of the pool. I’ve made huge improvements in my swimming the past 2 years since being involved as a TI coach. But as always, I want to be better, and faster. While speed isn’t necessarily my primary goal, it’s hard not to sometimes look around at other swimmers in the pool, know that many aspects of my technique are “better” than theirs and yet still they seem so comfortable swimming 10 sec/100 faster than me. 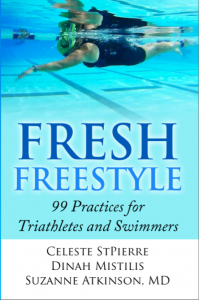 Rather than engage in “secret racing” I choose to focus more intently on my own swim and what I can do to improve it. 3×100 Free + 1 x 100 IM on a 2 minute base, rest 2 minutes between rounds. The intent of the set was to hold a consistent SPL for the Free while maintaining or improving my speed. The IM was focused on mainly the short axis strokes doing some focal points I’ve recently been working on. I managed to hold 17/18 SPL for all of the free (1 or 2 lengths of 19), and descended my time from 1:40 to 1:34 while doing so. But the lady next to me was still swimming 1:25s for 300yd repeats! At the end of the set I focused on my catch. I’ve been workign on this for awhile with Coach Dave, trying to eliminate a “too early” elbow drop. Even though I’m following his, and my own advice, I just continued to feel awkward. I tried another focal point I was reminded of by Terry this past week…”Move your elbow forward”. In the catch position, the notion of moving the elbow forward helps bring the forearm into a better catch position keeping the elbow from dropping too soon. From a standing position, you can see how this small thought & movement helps bring the elbow into better orientation for a good catch. I tried 2 lengths of it and it still felt awkward, my stroke count was 22 and I was frustrated. I motioned again at the side of the pool and relized that there was only so much “forward” I could gain while practicing the movement standing still at the end of the lane. I reasoned that when i swim, my body is already moving forward…why not try to simply KEEP the elbow moving foward as my arm fell into place? The next thing that happened was magic! I swam as I normally do, but this time I thoought about moving the elbow forward not with an awkward twist in my shoulder joint, but simply keepign the elbow moving as my body slid over the rest of the arm. There was a point where the arm then naturally moved backwards as if I was lifting myself out of the pool deck on a press out. I had mentally visualized this, and even demonstrated the movement on dry land hundreds of times…but it suddenly came together in the pool just by delaying the stroke a fraction of a second. I used the momentum I already had to move the elbow forward in a relative manner to the rest of my arm. I swam the next 2 25s in 20 seconds and the next 50 in 40 seconds and hardly felt winded. In the recent past, these would have been all out sprints for me. The key was in waiting, and during that waiting time, the palm is applying that oh-so-gentle pressure that I’ve heard about, as the body rotates and continues to move forward…but what follows feels like silky magic, rather than the big arm of water I’d had before. I definately will need to experiemnt more with this and I’ll keep you posted on how it goes. What does your catch feel like? This is how I want to learn how to swim. I can’t breathe properly and I move like a rock in the water. Will 3 lessons be enough?